Tonight I told Jack that I'd pay him five bucks for a five minute hug. He wriggled out early. He thought he did four minutes and deserves four dollars. Pretty funny. Tonight Mom started going through a bin of clothes that have cycled from us to Aunt Tracey back to us. They are small clothes that no longer fit Sam but are just right for Joe. You wore everything first. Memories around every corner. There are sweaters that Grandma made for you. There are the basketball jerseys we bought for you. Here are two. Mom and I think we'll retire them. I'll get Joe his very own. I love you my little superstar. They bloomed. Here they are. Doesn't Joe look like a little lumberjack. 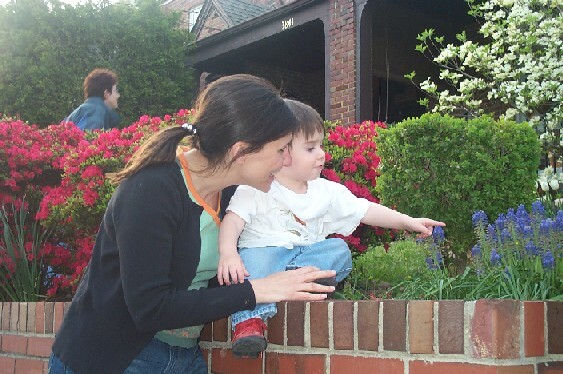 After I got home from flying we spent a lot of time outside in front of the house playing. Just like we used to do with you. Right before I took this picture, Joe took a poop. He was squatting down so far that he fell over on his head. It was pretty funny. He was okay, though, and had a good time at Stoddert tonight. Jen and Hannah came in today for the week. This is the kind of dog Aunt Jen and I had growing up. 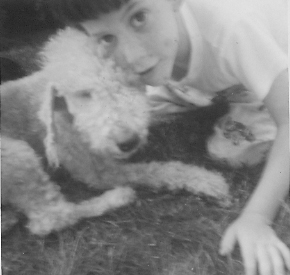 His name was Dizzy. Here are me and Dizzy. I am 7 years old. Same as you. I don't know this dog's name. He walked by and Aunt Jen freaked out. The dog is just like Hannah's dog, Kasha. They're pretty cute, huh. The woman who owns this dog knows Aunt Abby. It is a very small town. 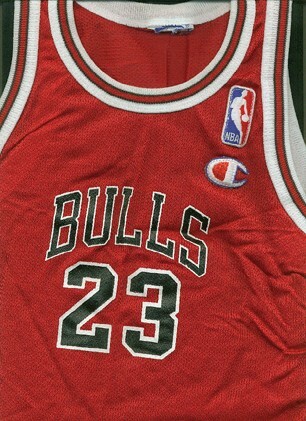 In the sports page this morning Michael Jordan took out an ad to thank "Basketball" for such a great career. We would have read that together. I'll see if I can find a copy to put on here. It is so hard to say goodbye to things you love. I'll write you later about my flying adventure today. You'll be with me. Yesterday I bought the Harry Potter and the Chamber of Secrets DVD because I was so sad thinking about you. I watched it last night hoping it might cheer me up. I don't know how many times I told you that you were Harry Potter, the "Boy that Lived." We both believed it. It was a good movie, but that Daniel Radcliffe sure is not a very good actor. I never got a chance to watch the video with you in Minnesota. Mom says that she and you watched it all the way through. That must have been nice. It looks a little sunny and warmer today. Maybe that will cheer me up. I think Mom, Jack and Joe are going to go out to see you. I am going flying with a friend from work in his plane. Of course I'll be thinking of you and the time we went up in Uncle Dan's plane. The Fanconi Anemia Research Fund's Family Newsletter came this week. I recall writing somewhere once, maybe a fundraising letter or email, that the most depressing thing was reading the two lists that are printed in each newsletter: "New Families" and "In Loving Memory." Strangely, but nicely, there is no list of new families. There is the list of those who have died since the last newsletter. The class of '95. You are on it. 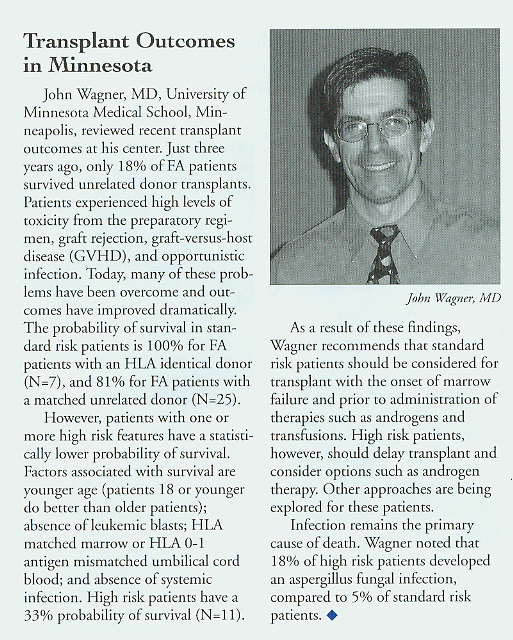 There also is an article by Dr. Wagner giving an update on the success of transplants in Minnesota. God knows, we all wanted so much for you to be a "success." Mom said something the other night which made so much sense. 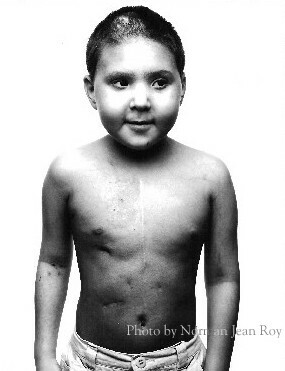 She said we thought there was no way you could die because you were such an extraordinary kid. Dr. Wagner is a great doctor and a wise and compassionate man. I once joked to Mommy that if the medicine thing doesn't work out for Dr. Wagner he could always fall back on his poetry. Below is a letter that he wrote to Mom and me right after you died. I asked him if Uncle Bill could read it at the funeral. It is very special. Hours have gone by now after Henry’s death and sadness must consume you. I can only imagine how difficult it must be, and now, so many will look to you for support. They will need you to help them understand and to deal with this loss. 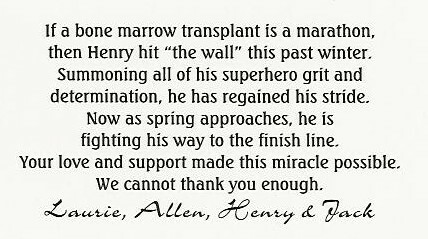 You and Henry have touched so many lives. This is really a tribute to both of you. Last evening as I was about to leave, there were so many things to say. I couldn’t. I was your doctor; I had an image to keep up—perhaps more for me than for you. After tucking the kids into bed last night and loving them all the more, Lisa and I talked (well, Lisa mostly listened). At the end, she said “you must talk to them…write them a letter”. It is my way to say goodbye. I won’t be there on Friday to help bury Henry so this is my closure to this long journey. Henry died despite everything. I really thought I could pull this off. I wanted nothing more than to show you that I could do this. Even when Henry got sick, he always rebounded. Henry seemed almost invincible—even to me. But hope disappeared in a blink. This transplant was supposed to work. I feel very bad. In the end, I am consoled by your words that ‘he was given two and half extra years’. You made the most out of every second of his short life. Yesterday, for the first time, I briefly looked at your website…now a memorial to Henry’s life. I couldn’t believe the moment had really arrived…and that the last entry was yet to be written. What would it say? How would you summarize that final moment? For you, there must have been no greater joy than having Henry by your side. I can’t imagine that you could have done a better job for Henry. You gave him life and you stood by his side every step of the way. You taught him to live and live completely. You gave him space and freedom…he could only know that he was loved. As his parents, you did what you had to do. You pulled every string, made every phone call, and traveled to the ends of the earth. Henry is gone. You will never see him again. You will never know what he was to become. Oh! How we could have used him as President. While you may sometimes wonder what he might have been, you will never wonder how much he mattered to everyone around him. You will always, always be proud of him. And, you will never lose that pride. But, the genes foretold of this day. We only refused to accept it without a fight. You wouldn’t have done it any other way. Though we failed to change the course of history, Henry’s journey was brilliant. I will miss him too. Henry, I cannot explain why but all of us are feeling really bad right now. Mom and Uncle Bill think it might have something to do with it being Passover. Do you remember how Moses instructed the Jews to put blood on their doorposts so they wouldn't be visited by the angel of death. It didn't work for us. We lost our first-born. We lost you. Jack was sitting alone on the floor of your room tonight looking through his "Henry Memory Box." Mom said when she came in Jack was very, very sad. He is doing incredibly well given the circumstances. He told Mom that he wants to come see you. I think that is a great idea. I had a terrible panic last night when I was getting ready to go to sleep. For some reason I thought really deep and hard about the fact that you are gone for good. The pain in me went so deep that I was scared. I was scared because I knew that I could do nothing to bring you back. I was scared because I didn't know how I could live without you. Joe was asleep and Mommy and Jack were in St. Michaels. It was terrible. I think Mommy is really sad but is being strong for me and Jack. I will be strong for her when she needs me. Joe takes care of all of us with his smile and his spirit. When he was in the bath this morning I was thinking he is a combination of Jack and you. Joe basically had no room to sit because the tub was filled with your Pokemon and Jack's whales and sharks. He lines up the whales on the edge of the tub the same way you lined up your Pokemon figures. He is lucky to have parts of both of you in him. After getting very pruney in the bath, Joe and I went out for a walk. We were stopped by a nanny who wanted to tell me how sorry she was that you had died. I didn't know her, but you have so many friends it was hard to keep track. I wish I could tell you her name. Speaking of your friends, Mom and Jack went to Georgetown to resupply the Band-aids. Everyone was there and Mom said it was very emotional. Mom also told me that "Henry's Toolbox" of Band-aids is a big hit with the other kids. It makes them feel good. A young couple bought the house next door. Joe and I spoke to them this morning. They asked about Joe's brothers and I told them about you and Jack. When they asked me how Mom and I are doing, I explained that we are very sad, maybe even more sad now than ever. I think that what is happening is similar to what happened to me after my knee surgery. I was in a lot of pain afterwards but after a while in bed I felt better and thought it was time to get up and get moving again. The only problem was I really wasn't all better and when I tried to move around I realized that it was too early and that I needed to heal a little more. I think sometimes your mind is ready to get moving again but your body, or in this case, your emotions really aren't at full strength. Two pieces of news about the house. First, we got rid of the "Whomping Willow" in the backyard. It is hard to cut down such a big tree, but that thing had the nastiest prickers. You'll be glad to know it is gone. I don't know why it took so long. The second important update is that we have cable again. It is a different company so we have to learn new channel numbers for our favorites, like Nickelodeon and Discovery. You'd be pysched, there is a new channel that is called "Toon Disney." They have a commercial for a CD of songs sung by Disney movie princesses, like Ariel, Belle and Mulan. I get a little teary when I see it. I know how much you loved those songs. We loved them together. Oh yeah, another musical note. Mom, Jack, Joe and I were in the car tonight listening to XM Kids and Schoolhouse Rock's "No More Kings" came on. I began to cry and turned my face to the window so no-one would see. That happened to me twice on the train back from New York. I know that this is just a stage in the grieving process. I am looking forward to the time when thoughts of you will make me only smile and laugh. I LOVE YOU SO MUCH AND MISS YOU MORE THAN I CAN SAY. p.s. My prediction was off. The azaleas haven't fully blossomed yet. A picture will come soon. You had a disease called Fanconi anemia. Having Fanconi anemia means you are missing the "Fanconi" gene in every single cell in your body. I feel like something similar has happened to me. I am missing you in every cell of my body. Just like you did for seven years, I can live with it but I feel it, it affects me. The only way anyone could tell by looking at you that you had Fanconi anemia is that your eyes were a little small. You shared those eyes with Molly, and Amitai and Emily Salo. Just like you, I have eyes that give away what I am missing. I look into my eyes when I sit at the gym (the whole place is mirrors) and I see my sadness. I see you not there. The other day this guy at the gym asked me if the weights were in kilos. He had a foreign accent and did not speak English very well. I told him, "no they are in pounds." A good thing for him I was your dad. Having taken you to the clinic every day and having helped you weigh yourself in kilos and then pounds, I was very up on my metric conversion. I remember cheering any upward movement in your weight. Even if you really didn't gain any weight I made you think you did. I went to New York yesterday and came back today. The train trip gave me a lot of time to think of you. I became very sad when I thought about what New York meant to us all of these years. Mom would always say that her trips to New York were life and death and I never thought too hard about it. She was right. If we had been successful at Cornell with Dr. Rosenwaks you would have been with us at the seder tonight. I have a lot to tell you about my trip but I am pretty upset right now and don't feel much like writing. I'll fill you in tomorrow. The good news is Jack's loose tooth. I know how you wanted to lose a tooth. Jack told me tonight that his favorite part of Passover is to be together. We all missed you very much. This is Jack writing. My tooth is loose. My second one in the middle. Bottom. Sam I Am Shoyer is having a sleepover tonight with Jack. It is spring (Passover) break, so Jack and Sam are still awake. It is 10:30 pm. I helped them make a blanket fort in the bunk beds. The two of them are wearing headlamps and watching Space Jam on your portable DVD player. It is a very sweet setup. I'll fall asleep before they do. I thought it was neat that they picked Space Jam to watch because tonight was Michael Jordan's last professional basketball game. He scored 21 points. I really messed up never taking you to a game. Sorry. I know you loved MJ. The Wizards wore the old Bullets jersey from when I was a kid. 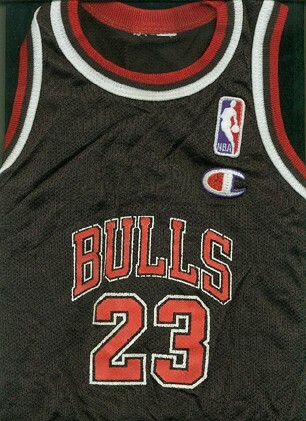 I would have liked to have gotten you one of those "throwback" jerseys. I remember when I took Jack to the game with Todd and Jacob and I bought you a no. 23 Wizards jersey. That thing was way expensive and way worth it. Oh yeah, your other favorite, Juan Dixon, played really well this year, too. I am going up to New York tomorrow for work. I think I'll walk around and take some photos of your favorite places, like the Pokemon store. Jen and Pamela got Mom a really cool Pez dispenser for her birthday. It is totally up your alley. O Henry. These days without you are so hard. I wish you could come back to me. I walked by Guy Mason tonight and saw a kid and thought it was you, or looked like you. Spring two short years ago. We sent this postcard to all of our friends to let them know you were doing well. We thanked them for helping us. All of us thought we were in the clear. This seems so far away. I cried tonight because you seem so far away. This is the card we sent out to friends this spring. Today was another spring day to remember. The flowers are exploding all over the place. 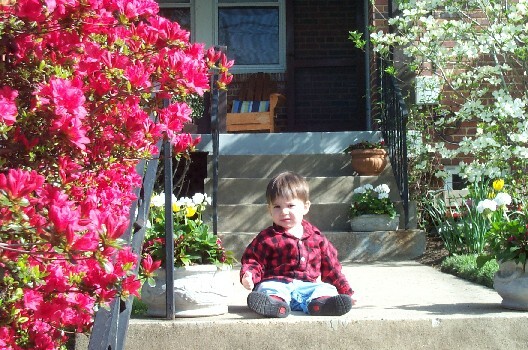 Our azaleas (the best on the block, right) are ready to burst. I'll show you a photo. I bet it will be in 2 days. Let's see if I am right. Debbie and Andy and Aaron and Daniel came in from Philadelphia and spent the weekend with us. We all went to Guy Mason and Max's for old time's sake. 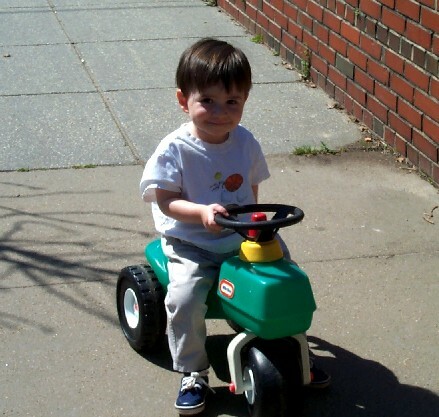 Mom and I pulled Jack's old tractor out from under the porch for Joe and he loves it. Your John Deere tractor that Grandma and Pop Pop Teddy got you is out at St. Michaels. I know Joe will have as much fun on it as you and Jack had. I had a good time with Joe today. 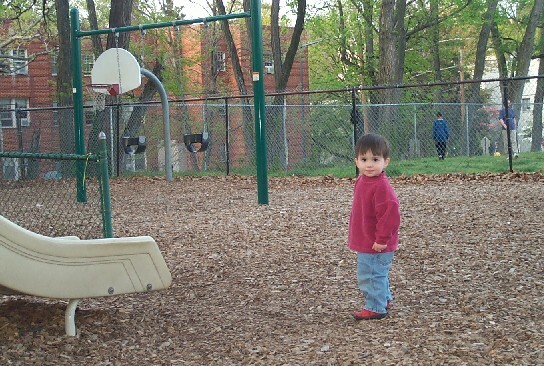 We went over to Stoddert and played for a long time on the playground. 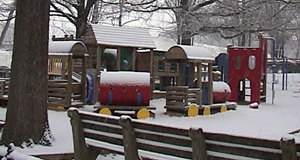 The "small park," as you used to call it. Joe was very excited to find big sticks and to uncover just the right rocks to put in his mouth. 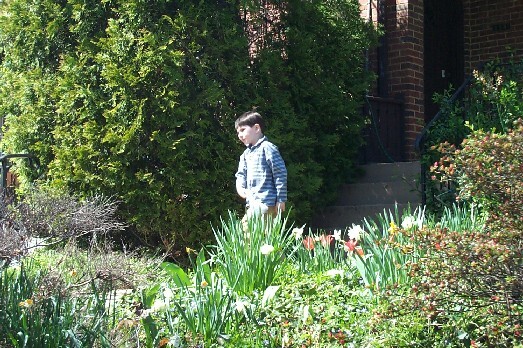 This next photo is Jack in front of Bill and Michael's yard next door. I took the photo from the front of our house. Looks like a jungle, doesn't it. Mommy planted some very pretty flowers. You used to make little bouquets for Mom. Do you remember the flowers you always bought for dates with Bella. What a gentleman. Jack and Aaron and David were being true boys today. 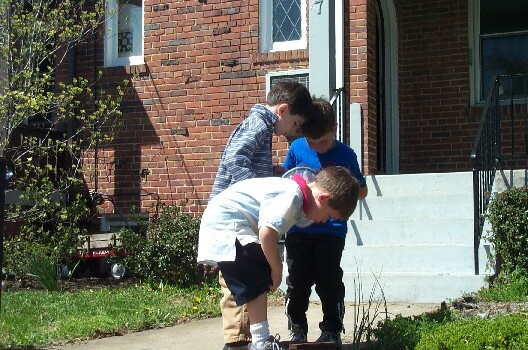 They went on a serious bug hunt. Poor bugs. We went to Turtle Park this morning. It is actually a beautiful, warm spring day today. This picture was taken in the winter. We ran into Jeffrey and Talia and Ellie and William at the park. I love this city. Jeffrey is back safe and sound from the war. Yeah. I didn't tell you about Rachel's Bat Mitzvah last weekend. Sorry. It was your kind of party. The girls looked like princesses and the boys wore tuxedos. Ari looked very handsome. The invitations to the party said, "Black Tie Optional." One of the things dads do is give their sons and daughters advice. It is just something we do. One piece of advice I'd give you is if you are invited to a party and the invitation says "Black Tie Optional," go ahead and wear the tuxedo. That advice is probably not necessary for you. You loved to get dressed up. You and Ari are alike that way. Ari was really "bustin' a move" at the party and that made me think of you, too. If you were there you would have been dancing up a storm with your buddy. That would have been fun to watch. Mommy and I played with Jake's mommy and daddy, Helaine and Rich, and Simon's mom, Susan, all night. Mommy looked beautiful. You would have told her that. I wasn't looking forward to wearing my tuxedo. It's a little silly, but I'll tell you why. I knew that the bow tie and the thing you wear around your waist, the cummerbund (another daddy tip: the cummerbund is also known as a "crumb-catcher" and that helps you know which side is up -- Steve Feldman taught me that), were thrown way in the back of the top shelf of my closet. I think I just threw them back there after the last time I wore my tuxedo which was Catherine and Tim's wedding years ago. Catherine and Tim and Winnie (can you believe how big she is) came by the other day to say "hello." 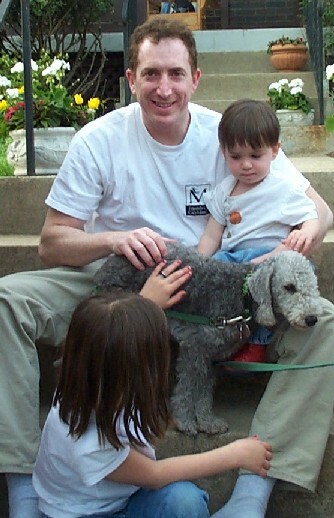 Joe loves dogs but Jack is freaked out. I think Jack is afraid of dogs because Jinx nipped him in the forehead at the beach when Jack's was a baby. He'll get over it. I knew there was something else that I threw on that top shelf that I wanted to keep but wasn't ready to look at quite yet. 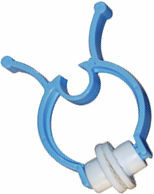 The night you died I pulled the intubation tube out of your throat. When I tried to pick you up to put you on Mom's lap, some blood trickled out of your mouth onto my t-shirt. For some reason I didn't want to take off that t-shirt and I definitely do not want to wash it ever. When President Kennedy died (they mention him in the Animaniac's song about the presidents) his wife wore a dress with his blood stains on it for a really long time. I understand why. Well, seeing that t-shirt wasn't all that bad, but I did start the evening off kinda sad. The next day after the Bat Mitzvah we ran into Ari at Sullivan's. How perfect is that. You know, Hen, what really gets me isn't how much I miss you ('cause that is just so huge and constant), but it is how sad I am that you are missing out on so many things I know you love. 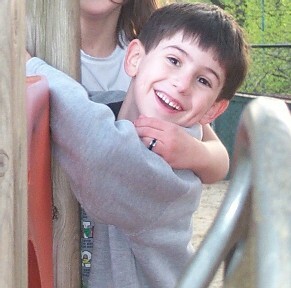 The Bat Mitzvah, beautiful days at Turtle Park, trips to Sullivans and my new job. Let me tell you a little more about the job. I work at a place called XM Satellite Radio and it is the coolest place. The people there are fun to be around because everyone is so nice and different. There are 300 something people in my building and so many look different, have different skin, different hair, different clothes, everything. XM radio is actually 101 different radio stations playing all kinds of music, and it all comes out of the building where I work here in Washington, DC. There are music stations, comedy stations, and most important of all, two kid's stations. One is Radio Disney, which is what we listened to down in Florida, and the other is called XM Kids. YOU WOULD LOVE XM KIDS! We listen to it all of the time and it is so funny. Jack's favorite songs right now are "Poop Goes the Weasel" and "Twenty-one Toilet Salute." He laughs so hard that I think he is going to pee in his pants. I LOVE to hear him laugh like that. Oops, remember the rule we had against "potty talk" I wonder if I am breaking that. XM Kids even plays a song inspired by Harry Potter and I know you would love hearing that. Our building is right near the train station. The trains whistle all day. When I hear the noise I look out and see the trains pass by. How cool is that. You remember that song we used to sing all the time, "I got my mind on my money and my money on my mind?" That was written by a guy with a great name, "Snoop Dog," and the version we listen to is by a group called "The Gourds." Whaddya know, The Gourds came by our building last week and played songs. I asked the person who brought them there to play if they could play the "I got my mind on my money and my money on my mind" song. 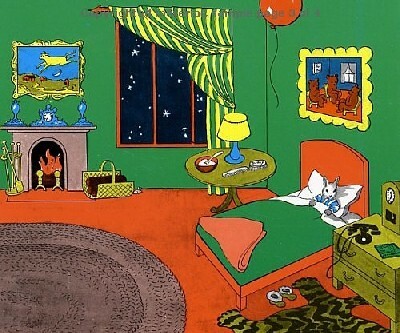 I read Goodnight Moon to you last night before I fell asleep. I just wanted you to know that I totally know you are way too grown up for that book. But I really wanted to read it to you. In a way, the little bunny that is getting ready to go to sleep reminds me of you. He looks really cozy and that is how I like to picture you. What is kind of interesting is that Mom and I live your entire life in our minds. 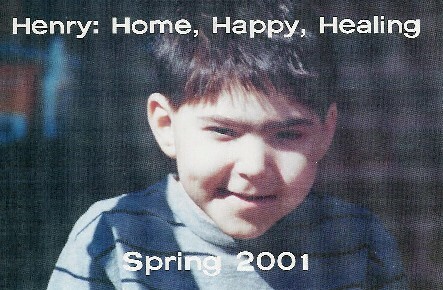 We think about you when you were a little squirt all the way up to the big, 7 year old boy you were when you died. I wish there had been a lot more years and a lot more memories. Just a little update on brother Jack. He is pretty much the same. Only difference now is a full-blown obsession with Yu-Gi-Oh. 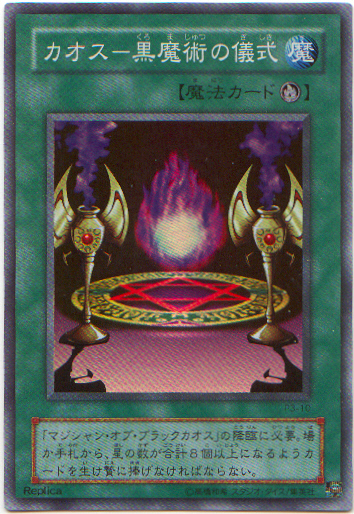 I would say that he likes Yu-Gi-Oh as much now as when you loved Pokemon after Batman and before Digimon. Funny thing is that he trades these cards with his friends and they won't let them bring the cards to school. Check out this card. I think it is the perfect thing for the Jewish Primary Day School, but I guess they don't see it that way. Jack always asks me to get him this card or that, and I do my, "of course, whatever you want" thing. Well that kinda backfired on me. I went online with Jack to buy these two cards he really wants. Guess how much they cost. $95 apiece! Holy moly. Guess who had to tell Jack that he wasn't gonna get those 2 cards. I have to be more careful about what I promise. Benjy is back from Morroco for Passover. He came over today and played with Jack. I think Jack was in heaven (did you see him?). Tomorrow will be more Benjy and then Aaron Katz is in town for a visit. Mom just told me that she wants to take Jack to the doctor tomorrow morning. His voice is hoarse. I am not sure but I trust Mom's instincts. I have so much to tell you but I am pretty tired right now. I'll write you some more tomorrow. Actual conversation with Jack that happened two minutes ago. Jack is watching a Yu-Gi-Oh video that he and Mom rented at Blockbuster. Dad: Jack, haven't you seen this one before. Jack: Yeah, but this one is on video. I'm sitting here struggling with how to sign Mommy's birthday card. I've always signed things from Daddy, Henry, Jack & Joe. I thought about this a lot. I am sad and I am unsure what is right, but I know what I feel. I decided to go ahead and sign your name. I have your proxy on these matters (grown up talk), and I don't feel right about "cutting you out" of this. I hope she likes what we got her. Remember how Helaine set it up so you could play chess with Jake on the Internet. That was fun. Today is Mom's birthday. I'll let you know her birthday present after I give it to her. It's a surprise. Hope she likes it. It was always easy to buy you a present. Stick to Pokemon, Digimon or Star Wars and we were guaranteed a smile. Last night I was addressing cards to some of the people who have been nice to you and us over the years. I wrote envelopes to the woman at LucasFilms who gave us the Star Wars stuff (Yoda still keeps guard upstairs); Norman, the nice man who produces the Pokemon movies and gave us Pokemon 4 before it came out in the theater; and last but not least, the super duper sweet woman at Warner Bros. who made sure you saw Harry Potter even though you weren't able to go to a movie theater. There are a lot of nice people in the world. I hope someday I can do favors the way they did and make people smile. I was telling you about how I have a lot of mixed feelings. Here is one I was thinking about on my way to work this morning. I really LOVE my new job, but I am sad because you aren't here to know all about it and to enjoy it, too. I guess the rest of my life is going to be like that. What are you doing being dead; I've got so much to share with you. Guess what. Your hospitals played each other yesterday. Georgetown University Hoyas beat the University of Minnesota Golden Gophers in basketball. I looked to see how Sara's season went and she got a lot of awards for playing so well. Here is the story I found. Washington, DC— Georgetown Volleyball Head Coach Li Liu announced the winners of the 2002 Georgetown Volleyball Team Awards at the annual banquet held at Maggiano’s. Awards were handed out for Most Valuable Player, Most Improved Player, Leadership, 100% and Coach's Award. Sophomore middle blocker Sara Albert (Davis, Calif./Davis) received the 2002 Coach’s Award. Albert led Georgetown and the BIG EAST all season long in hitting percentage with a .411 average on the strength of 257 kills with just 58 errors in 484 attempts. The .411 hitting percentage also ranked her seventh in the nation among Division I players. In addition, Albert led the team in blocks with 139, including 32 solo stops, and was second on the squad in kills with the 257 total. She picked up BIG EAST Player of the Week honors during the week of October 7 after recording a triple-double performance against Miami. Albert had 11 kills, 11 digs and 10 blocks in the Hoyas’ 3-2 victory over the Hurricanes. I am sorry you never got to see her play. I know she cared about you a lot. 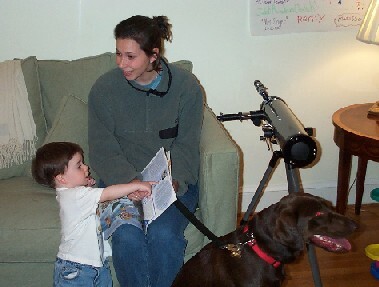 Now that I am working and getting home late, my big thing is to read "Goodnight Moon" to Joe on my lap. When we're done, I give him a kiss and put him in his crib to fall asleep. Tonight I tried to read "Curious George and the Bunny" before reading "Goodnight Moon" and Joe basically said, "No way, Dad." He kept trying to shut the Curious George book until I got the message and picked up "Goodnight Moon" and started reading. He's a man who knows what he wants. I thought it was sweet. Last night I was reading Jack a last book and I had to stop a few pages into it and ask if I could finish it another time. The book was about whales. I ran into a problem when I reached a page that talked about how whales hold their breath for up to two hours. The book said the whales' lungs aren't all that special, they just know how to use them really well. I started thinking about the PFT tests you took in Minnesota. Do you remember how you sat in the space ship thingy and blew into the hose. Remember how we held on to the nose clip and brought it back to the hotel with us. We used it as protection against stinky feet and all other bad smells. We couldn't wait to show Jack when he got there. You did such a great job blowing and not freaking out inside the chamber. Your lung capacity wasn't exactly right, but I don't think anyone was too worried. I wish they had been. Your lungs had the infection that made you die. I used to think you got the infection when we went to go get Mom that present at Ampersand. You weren't supposed to be around construction sites and they were definitely working on that building. Thinking about all of this last night made me sad. Isn't that crazy; whales make me sad about you. Mom was out with Jen Klein, Pamela, Samantha Knapp's mom, Jeannie and Val, so I just went to sleep when Jack went to bed. I have a lot to do at night, but can't seem to get anything done. I gotta work on that. This morning I was listening to the radio again in the car. A man who is the poet for the United States (how cool is that job) was talking about how April is poetry month. Did you know that; I didn't. You used to write poems in school. I need to find some and put them on here for us to read together. The man said that someone once said, he didn't say who, that poetry is the clear expression of mixed feelings. Mixed feeling is what I'm all about -- I am glad you're not suffering but I am so sad that you aren't here with me. I wish I could write some poetry to talk about the mixed feelings I have. I don't think you had mixed feelings when you wrote your poetry. Basically it was how much you loved Mom or Bella. You were very certain of those feelings. What do you want to get Mom for her birthday. I guess I'm not supposed to get her anything from you. That is probably not right. Yikes, I'm not so sure what to do. It is gonna be hard to write a card just from Joe and Jack. Speaking of poetry, your buddy Jeffrey is over where the war is taking place. He is writing stories about the war and I read one today. In the middle of all the bad fighting Jeffrey found a guy who is kinda like the poet of that country, or will be when they get rid of the bad president. Jeffrey wrote some stuff about the poetman. Do you think Jeffrey knew April is poetry month. Probably, he is a smarty farty. I hope Jeffrey comes home soon. Remember when you watched TV in Jeffrey and Pamela's basement. He was very sweet with you. That was nice. It doesn't seem so long ago. Oh my god, I almost forgot. Do you know what today is? April Fools Day. I told Jack when I woke him up that there was 3 feet of snow on the ground and school was cancelled. When he rolled over to go back to sleep, I told him, "April Fools!" Then Jack started playing April Fools jokes all morning. He was really funny. We are such kings of bad jokes. You know what the worst joke is, and it better be a joke, the cable went out. We can't watch Spongebob, Jimmy Neutron or The Wiggles. We'll give it some time to start working again. I wanted to tell you a little about my job, but I'll do it tomorrow. I will tell you that I wear this necklace thing that has a photo of me on it attached to a cord that pulls in and out like a tape measure, or a dog leash. You were a huge tape measure fan. Remember the one Grandma gave you. You loved playing with that thing. You would have loved playing with my ID, and I would have loved for you to play with it.